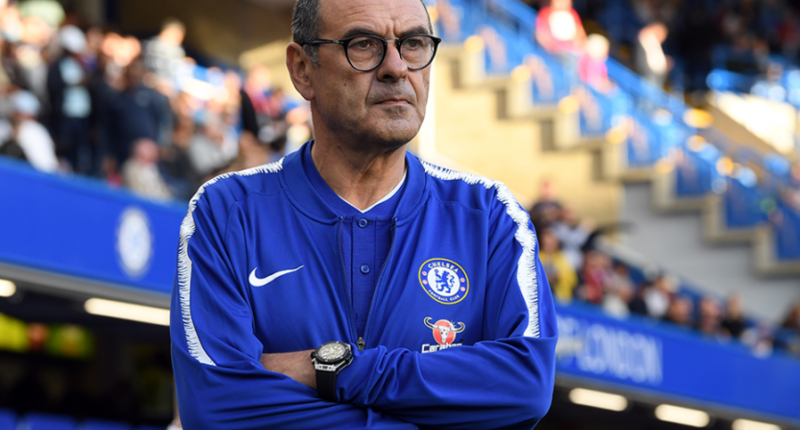 This past Tuesday, Sky Sports reported that senior figures at Chelsea had held talks over Maurizio Sarri’s future. The fact that this happened shouldn’t come as a surprise to anyone. The players have all but quit on their manager and their recent results have been dreadful. Domestically, Chelsea have lost three of their last four matches, and they haven’t been particularly close. A 4-0 loss to Bournemouth was followed by a 6-0 shellacking by Manchester City. Their 2-0 FA Cup loss to Manchester United may look closer on paper, but Chelsea didn’t have a shot on target after the 11th minute and United’s attack was hampered by injuries. The question over Sarri’s future has all but changed from “will he be sacked” to simply when. In fact, Sky is now reporting that Roma have reached out to Sarri’s people inquiring about next season. Sarri simply can’t stay, his tactics aren’t working, he’s too stubborn to change what isn’t working, and the players have all but quit. The problem for Chelsea is that Sarri isn’t the (only) problem. Like most teams, Chelsea may receive a nice boost after sacking Sarri. They may even ride that boost to a fourth place finish and possibly win the Europa League. But even if that were to happen, as soon as the season ends there will be a major question of “now what” surrounding the club. Chelsea have dug themselves into a hole. They’ve done it to themselves by creating a culture where the players have all the power and building their teams through the transfer market with older more established players. Unsurprisingly, that team is now old. Come next season. Chelsea will be without a striker, as this January they opted to sign Gonzalo Higuain on a short term loan rather than see what they have in 21-year-old Tammy Abraham. Eden Hazard will probably leave for Real Madrid and their remaining wingers, Pedro and Willian, are both on the wrong side of 30. Defensively, David Luiz is 31 while Cesar Azpilicueta and Marcos Alonso are 29 and 28 respectively. This team needs to be rebuilt, which is problematic considering FIFA just handed Chelsea a transfer ban for the next two windows (they will appeal the decision so how long the ban is and when it begins is still in question). Rebuilding at Chelsea won’t be easy. By definition, a rebuild takes time and patience. The latter of which is not a virtue in West London. A rebuild at Chelsea can’t happen quickly. Especially now. They’re a club that’s used to finding players in the transfer market. They don’t have a pipeline from their academy because their academy is designed more to sell players for profit. Depending on the result of the appeal, that may need to quickly change. You can argue Chelsea’s rebuild already got underway in January. They spent £65 million to sign Christian Pulisic from Borussia Dortmund and refused to sell 18-year-old Callum Hudson-Odoi to Bayern Munich. But both of those moves are still shrouded by question marks. Pulisic has been unable to even buy a game at Dortmund this year and will certainly need time to adapt to the Premier League. Chelsea promised Hudson-Adoi first-team opportunities this season, yet despite the results he’s still riding the bench. Either Sarri doesn’t trust him, or maybe he’s just not that good (yet). Even if Chelsea are committed to a rebuild, the club still can’t get out of their own way. Just after reporting that the meeting discussing Sarri’s future happened, Sky reported on possible replacements for Sarri. Those are two very interesting names with one big thing in common. Neither one has overseen a rebuild. Zidane doesn’t get enough credit for the tactical job he did at Real Madrid, but he didn’t build the team. He walked into a team with Cristiano Ronaldo, Gareth Bale, and Luka Modric already there, he just figured out how to use them all together. When that team ran its course, Zidane fled. Lampard is an interesting name because of the obvious Chelsea connection. Due to his status as a club legend, Lampard is the one person you can see the club possibly having some patience with. Does that make him the right choice? The man only has seven months of managerial experience! Lampard’s stock is high right now thanks to the work he’s done at Derby County but the reality is he’s been merely okay. Last season, Derby finished 6th in the Championship, earning a spot in the playoffs. Right now they’re in 7th, two points behind Bristol City (who have a game in hand). That’s not a knock on Lampard, but it’s certainly hard to say he’s clearly improved Derby. The reality is Lampard has been slightly overrated thanks to some perceived strong Cup runs. After defeating Oldham and Hull City, Derby went to Old Trafford and eliminated Manchester United on penalties. That set up a dream draw at Stamford Bridge, where Derby put up a good fight before getting eliminated. In the FA Cup, Derby advanced on penalties over Southampton and defeated League One side Accrington Stanley before getting eliminated by Brighton. Those are two decent cup runs, but nothing really that special. If Chelsea can’t sign players, they’ll need a manager who can integrate academy players into the first team. The only way to do that is if the manager doesn’t feel the pressure of having to win immediately and therefore needs to revert back to using Willian and Pedro every week. Chelsea have a lot of issues to fix. It’s not an impossible task, but it requires giving their next manager time. Unfortunately for Chelsea, that’s the one thing they aren’t known for doing.